Individual souvenirs and trophies of combat usually emerge from any war, but during World War 1 "soldier artwork" became its own art form, due to mass production of items by the vast numbers of the participants of the war. "the craftsmen of the trenches" or " artisanat de tranchées"
Found in many forms and sources: the Army, Navy, Submarines, Flying Corps, Auxiliary Services, Chinese Labour Corps., Rest Camps, Engineering Depots, Behind-the-Lines workshops, Prisoners-of-War, Wounded or Disabled Servicemen, Civilian artisans, French & Belgian cottage industries, Field Blacksmiths, and the jewellery trade. Commercial "Souvenir Workshops" also contributed, supplying demand from UK and foreign Stores for military memorabilia whilst in the United States, ammunition surpluses were mass-turned into commemorative items. 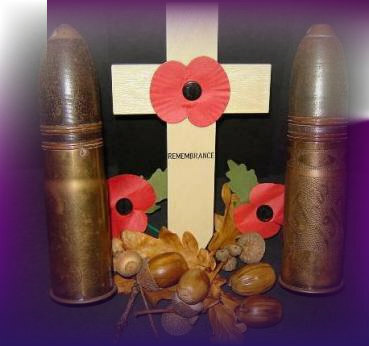 Individual and unique pieces were often crafted on a made-to-order basis for combatants to commemorate their war experience, maybe for a loved one or family member....or sometimes commissioned by the family as a memory item for a life sacrificed. Mass produced items were made for visiting battlefield pilgrims or tourists, also many designs fashioned well into the 1920's and the art noveau period. Genuine relics discovered to-day are around 100 years old, and have survived the trauma of previous decades when metals were highly sought-after for munitions or other industrial needs.